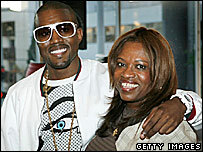 The mother of rap star Kanye West has died at the age of 58 after complications following surgery. She was taken to hospital after she had stopped breathing at her home, and she could not be resuscitated. West's spokesman said "the family respectfully asks for privacy during this time of grief". In May, Donda West published the book Raising Kanye: Life Lessons from the Mother of a Hip-Hop Star, in which she paid homage to her famous son. She was chairwoman of the Kanye West Foundation, a non-profit organisation that aims to improve literacy and stop young people dropping out of school.